This beachfront resort is next to the Palace Macau and is perfect resort for families. RIULand Mini-club has a kids pool that has a special water play area. The RIU staff will also have many water activities and crafts waiting for them. The adults can enjoy the non-motorized water sports like kayaking, wind surfing, sailing. 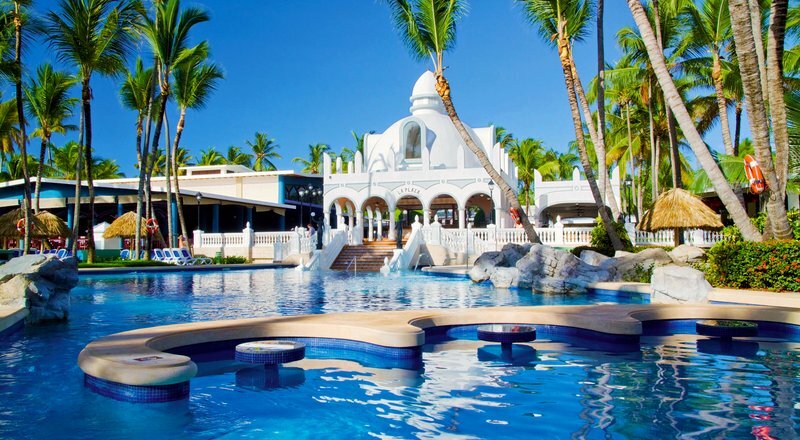 The adults can go to the spa at RIU Palace Punta Cana where you can pamper yourself with different treatments or massages. The evening starts with live music and shows for all to enjoy put on by the entertainment staff. If you still have energy left you can go the disco and dance the night away or try your luck at the casino. Family rooms are available in the 740 room complex. All rooms have a balcony or terrace, mini-bar, liquor dispenser, and safe. There is a fee for the Wi-Fi in the room however it is free in the lobby. Five restaurants and four bars are all there for your enjoyment. The “Colonial” restaurant with terrace and non-smoking section, “San Angelo” Italian restaurant, “Hibachi” Asian restaurant, “Chilli’s” Mexican restaurant, “Mama Juana” poolside restaurant / grill and steakhouse, “Azúcar” lounge bar, “La Plaza” bar with terrace, “La Arena” poolside bar and swim-up bar, Sports bar (open 24 hrs).